I've just received my first order from chapterhouse and have eyed them since before the GW fiasco. 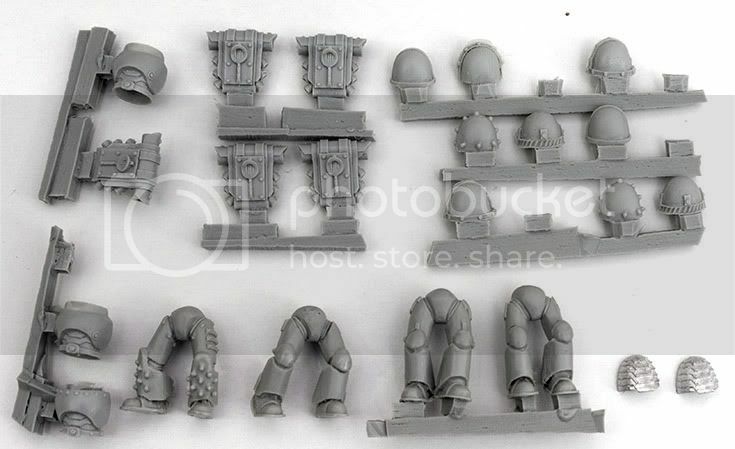 I bought: true scale marine kit, ymgarl heads, 2 shoulder pads and two scar gun sprues. What made me post this is the sprue of torsos. It looks like it would wear the mould much faster because much of it is snagged in a recessed area (rounded slot for head and for legs). Or if pulled too hard and fast, would rip a portion of the mould clean off. They are attached to single stick of resin by where the arm would go, so the slot for legs is very close to the slot for the head of the torso below and so on. It's about 5mm apart. I guess it's not a big enough problem or they would have gone with a different layout.. but anyone have any comments on this? remember, on both side of the 5mm space is 3-4mm piece stuck into the torsos. The kit itself is everything i expected, very plain but slightly lower quality than GW or competitors (not because of mould wear, the smooth surfaces and detail isn't top notch). On the other hand, the scar guns are insanely good. There is a right amount of detail and it's all super crisp, I could easily mistake it for a maxmini item. So in conclusion, true scale kits look a bit rushed but would suit conversions and additional details being added (what I plan to do) but on their own, not very impressive. They are impressive in their size, definitely. The metal ymgarl heads are good but could be improved with more or finer detail - but have good variety of 'poses'. Resin guns are perfect. No miscasts or damaged items. Most parts have holes in the parts and some could be fixed with additional drilling. Sprue contact points are very good. That's all for now. I was going to purchase more resin stuff from various stores including puppets war but will need all the money for a small business venture. Puppets war are really stepping up their game. PS. posted this on WAU but reworded a bit. Thanks for the review Ken. I'm glad to hear that you find at least some of the items to be high quality - I don't think anyone can argue that Chapterhouse are gradually stepping up their game. It's hard to understand exactly what you're saying about the torsos - any chance of a pic? Do we know if the guns were mastered as 3D prints? Yep, I generally don't listen to all the haters who just make blanket statements that their products are bad (even if their one product was bad). I guess what you can learn from this is their quality varies considerably unlike established companies like (obviously) GW. Not 'true' heigh comparisons due to elevated bases and angle, but it doesn't matter really. I mixed things up as much as I could. 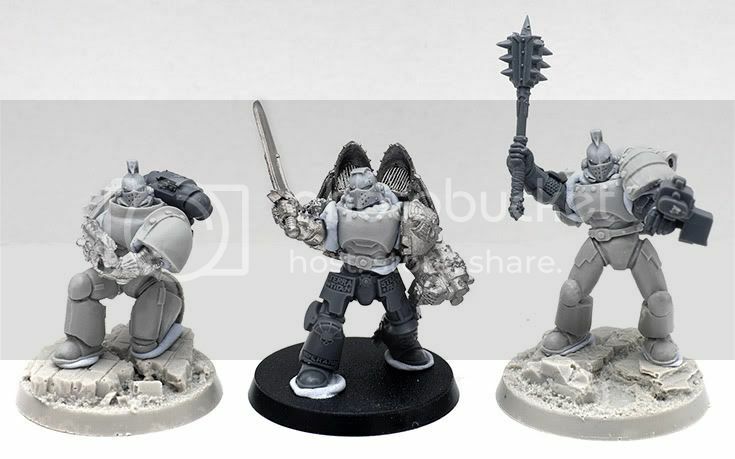 They are beastly as you can see and if I was made of money, my default marines would be true scale (since I collect 'humans' as well). Even if you only have marines, you can compare against the puny enemies. The parts below are obviously incomplete, it's whatever wasn't used in the minis above. 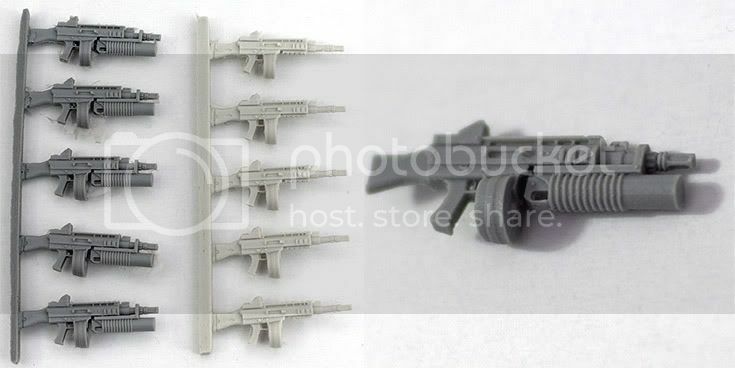 Guns come on a sprue of 6. Shoulder pads are rather meh, but more variety is good. These don't even compare to micro art pads which I decided to leave off the examples. Very interesting. It all looks quite good from the photos. The truescale marines themselves look a little bit bland - like they require another pass of detailing - but that's easy enough to rectify by adding detail. The guns look very nice. Obviously expensive 3D prints to get that level of detail. I wonder who the artist was?